Candidates will have to fill in the prescribed exam centres while filling the application form and appear at the allotted exam centre on the day of exam. The world of technology is rapidly evolving. In the last 20 years, scientific and technological advancements have fundamentally altered the living and lifestyle. Everything from electronics to information sciences to nanotechnology have caused drastic changes in the technological and engineering environment around the globe. Candidates must have passed class XII or any equivalent examination with minimum 50% marks in aggregate with Mathematics, Physics, Chemistry and English as subjects. Candidates must have passed class XII or any equivalent examination with minimum 55% marks in aggregate with Mathematics, Physics, Chemistry and English as subjects. Candidates must have qualified JEE Main 2018. 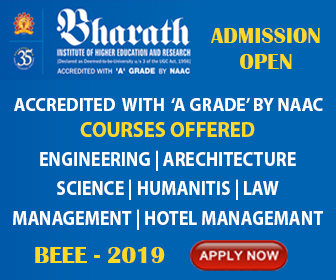 Candidates awaiting their examresult of class XII or its equivalent examination can also apply for the exam.Candidates must have completed 12 years of formal schooling in order to apply for the program. Admission in ITSAT 2018 will be based on candidates' scores in ITSAT 2018, JEE Main 2018, State level or any other National Level Engineering Entrance Tests 2018. In case a candidate is found ineligible for whatever reasons even after admission in the programme, then also his or her admission will be cancelled. Alternatively scores of JEE (Main) 2018/State Level/Other National Level Engineering Entrance Tests 2018 are also accepted for all The ICFAI Universities except The ICFAI University, Himachal Pradesh. Merit Scholarships based on Semester-wise performance in B.Tech Program. The ICFAI University offers two types of merit scholarships to students. Icfai Tech School Admission Test (ITSAT) is an All India Admission Test conducted by The ICFAI Foundation for Higher Education (IFHE), Hyderabad for students seeking admission into the B. Tech. Program of IFHE Hyderabad, The ICFAI University, Dehradun, The ICFAI University, Jaipur, The ICFAI University, Jharkhand, The ICFAI University, Raipur. The candidates opting for only The ICFAI University, Himachal Pradesh need not appear ITSAT. The results of the ITSAT 2018 will be posted online on www.ifheindia.org/its on May 07, 2018. Successful candidates will be intimated individually through E-mail/post.